Welcome back to a new school year! Yes, I know it's almost November, but with the new secretary position, I hadn't had a chance to get caught up until now! Thank you for being patient with me! So along with the new secretary job, I am still the media/tech, however now we have two days a week of awesomeness! On Thursdays we have makerspace or coding activities, and on Fridays we do typing and technology. It has been exciting to have an afternoon of makerspace/coding added to the curriculum, and the kids are loving it! Since I am so far behind though, I will try to catch you up in a couple of posts. First, a HUGE thank you to Mrs. Walker and Mrs. Z for the Otter Box grant they scored last year...thanks to them, we have a library filled with brand new tables and chairs and it looks great! The dry erase table tops are a huge hit with the kids too! We kicked off our first week of school by learning about digital citizenship and internet safety. We watched a video and then had a wonderful discussion about keeping ourselves safe. The kids were really involved in the discussion and had a lot of questions. Please continue the conversations at home, occasionally check their browser history and be aware of what and who they are communicating with online. Computers are wonderful tools, but kids can sometimes be targets, and it is our job to keep them safe! The second week of school, the makerspace activity was to build a structure out of newspaper. However, there was a catch, after being allowed 3 minutes of discussion and planning with their teammates, they had to create the building without talking.....what?!? This took them by surprise and was quite difficult for most of them. But then, that was the point of the activity. How well did they prepare, and did they work well together. Collaborating as a team is something we are really striving for. I love their creative troubleshooting here! And they really had a great time and learned a lot about teamwork and sharing. What a great activity! We might come back to this later in the year to try again...now that the kids know what to expect they can work together to improve their designs and ideas! I hope you enjoyed taking a peek at our August activities! My next post will share our September fun! Thanks for stopping by! Hello and welcome to another year! As you all know, I started a new position at Stove this year and I appreciate all of you being so patient while I learn the ropes as your new secretary! Learning all the new software programs has kept me quite busy throughout the first trimester of the school year, but now that things are settling in I'm excited to catch you up on all the cool stuff we've been doing in the makerspace and technology lab! Between our fundraisers with Mishawaka, money from the PTO, and donations from the community, we have started to build a fun space for our kids to create, read, learn and grow! Every Thursday we have makerspace or coding activities, and every Friday we have typing and technology lessons. We hope to ignite your child's true passion! It has been proven that when kids are engaged in creative thinking, they learn at a deeper lever, and that's just the kind of atmosphere we're trying to create! We've also updated our library with over 60 new book titles that the kids are really excited about, so we hope you'll drop in and take a peek! Again, if you have any questions, please don't hesitate to ask! See you in the halls! We've had a very busy March so far! First we celebrated Read Across America Day which is on March 2nd (and also happens to be Dr. Seuss's Birthday)! During library time, the 2/3 class enjoyed trying to read Fox in Socks as fast as they could without making any mistakes! (The "Sue sews" page really stumped several of them..hahahah). We also enjoyed another visit from Grandmother Spider, who shared more tales from her web with each classroom! "8 Class Pets + 1 squirrel *1 dog = chaos" by Vivian Vande Velde. The kids are really enjoying this book about classroom pets and each animal tells one chapter of the story...funny stuff! I also took a cool training from the PSD Ed Tech team on Pixton.com. Its a fun website where you can create comic strips or do storyboarding to share your stories. This program can be used to teach and learn all kinds of subjects, including literacy, math, science and history! Imagine...instead of doing a paper on the pilgrims at plymouth rock, you make a comic strip instead. The site is free for folks to check out, so have some fun playing around with it if you get the chance. We will be creating our own comics next month after our 3D design is complete. And speaking of 3D design, isn't this interesting! I thought the kids could appreciate how this ties in with what they are doing in technology right now! We are all engineers after all! I have a 3D printer checked out from the district, and it should arrive in a couple of weeks, so the kids are excited to see their designs come alive on the printer! Remember the 4/5 class Olympic Athletes link I shared with you last post? Well the Livermore kids created some Olympic videos to share on flipgrid too, so our students got to watch their videos and comment on their work with their own videos. The Livermore kids will be watching and commenting on our videos as well, so its fun to see the kids collaborating throughout the mountain schools! Meanwhile the 2/3 class was feeling left out since they didn't get to do an Olympic interview, so they shared their plans with us for Spring Break! Check it out....​flipgrid.com/6ff68c A couple of the kids didn't realize their headphones were affecting their sound, so Natalie let them know in the comments section! :) hahahhahah! And finally, I'm thrilled to announce we have two new sewing machines added to our growing Makers Space in the Library! These sewing machines were donated to our school from my cousins Greg and Christy Wolfe, who are the designers of Inertia II, a centrifugal pumpkin launcher, that has won first place at the World Punkin Chunkin Championship two years in a row. ​ They think sewing is an important skill and want kids to continue to follow their passions and dreams through hard work and creativity! Thank you for your very generous donation Greg and Christy! Wow...did this month fly by or what!?! Lots of great things happened this month! I took a training through code.org, Computer Science Fundamentals, which was awesome, and I can't wait to share some of this great stuff with the kids! We hope to add more coding to the curriculum next year, so this should kick things off nicely! We finished reading Clementine in our 2/3 class library time, and the kids loved it! If you haven't read Clementine, give it a go! She had the kids laughing out loud and its a great "read aloud" book! If you enjoy it, theres an entire series to continue the fun! We enjoyed a visit from Grandmother Spider from Spellbinders. Spellbinders is a non profit organization that engages children through the art of oral storytelling to build literacy, imagination, character and community. The kids were fascinated with Grandmother Spider...and who wouldn't be, she lives in a cave after all. We are thrilled she will be visiting again next month! I can't wait to hear what tales she will share from her web! The K/1 class and the 2/3 class are working on animal riddle books in an art program called Pixie, and they will each get their own copy when finished! The 2/3 class and the 4/5 class have started their intro to 3D design, and we will be checking out a 3D printer from the district next month to print their designs. The K/1 kids will also get a chance to design their name in the 3D program, so we have lots of fun planned for next month! Welcome back to 2018!! I hope you all had a wonderful break! Here are a few photos to catch you up on what we did last month before break..
During library time in December we learned about Christmas, Hanukkah and the Winter Solstice. Then the kids enjoyed trying their hand at the dreidel game. They loved this activity and it even got a little rowdy during the game...all in good fun though! Nice spin Victoria! ​ We finished computer class up with more coding, the cubelets and code combat! King and Landan discovered a coding music program, so they spent their class period creating music. They came up with some fun scores too! 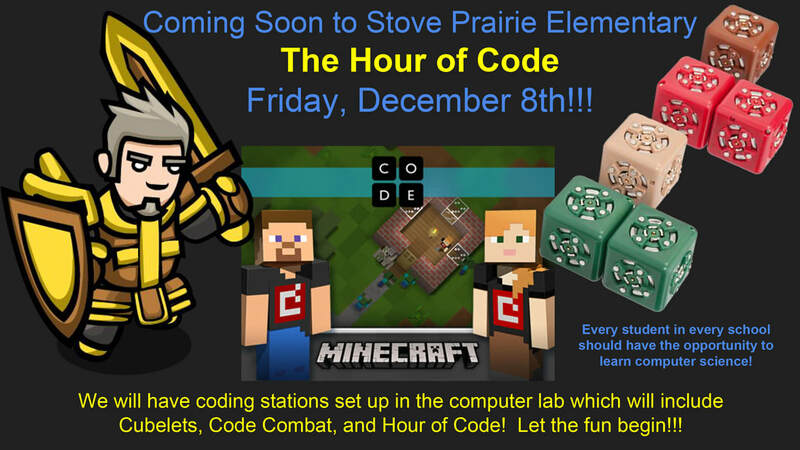 There was something for everyone during our month of coding, and we will continue with more coding in January. Coding has become part of the curriculum in schools across the globe, with the job market screaming for computer science majors, so its important to expose as much of this to the kids as we can! Plus, they LOVE it! We received a very nice Thank You note from the VFW in Fort Collins for the Veteran's Day cards, and its posted in the library if you'd like to take a peek! Their artwork was a big hit in Red Feather and Fort Collins. ​ Our last day of school before break was a blast! Adam McBride from our Ed Tech Team in Fort Collins came up to demonstrate the awesomeness that is the Star Lab! This traveling planetarium inflates with a large fan and the kids crawl inside to see the show. We learned about the constellations Orion, Sirius, Betelgeuse and many others. We also learned about the milky way and the planets. All this and pajama day too! What a great way to kick off the winter break! Thanks for coming up Adam, the kids were thrilled to have you! And what would the New Year be without some resolutions!?! Please go to our flipgrid site to enjoy some of our Stove Prairie Stallions sharing their aspirations for 2018. ​Thanks for dropping by and I'll see you in the halls! Last Friday was our Hour of Code! Kids of all ages across the globe participated in coding for an hour to introduce more people to computer science from December 4th - December 10th (which also just happens to be Computer Science Week). We kicked off our celebrations with a drawing for a free t-shirt...and look who won! Congratulations Oliver! Then during technology class each class broke into groups to explore Cubelets robot blocks, Code Combat and of course the Hour of Code website, which hosts dozens of coding games for kids. The 4/5 kids were the first group and they just loved the Cubelets! There was a lot of teamwork and collaborating going on, and of course, lots of smiles too! The 2/3 class were the second group to participate and they couldn't wait to get their hands on those robots! Meanwhile, they enjoyed exploring some of the fun games the Hour of Code website had to offer...Madison dabbled in some Monster High coding, and then she tried some Barbie coding, while Ben and Josie tried their hand at Minecraft coding. The K/1 class was next, and they were naturals! They were intimidated by the coding concept at first, but once they played around on it for a bit, they took off running! They enjoyed the Angry birds coding game, while Eligh explored a unicorn coding game as well as some others. But it was unanimous...they all loved the Cubelets! We are so fortunate to be able to check out cool learning tools like that from the district, but I'm hopeful that we can purchase some of these for our technology lab in the future! At the end of class each child received a certificate for participating in the Hour of Code, and its my hope that they will continue to explore these games and improve their skills on their own at home! We will be coding all month, so stop on by and check it out! Here are those websites...​hourofcode.org or ​https://code.org/ or ​https://codecombat.com/ (and the classroom code is PoolHideMilk). All of these websites are free and they dont need an account to log in, though they will need to use their google account to log into code combat, which is their school email, and the classroom code is provided above. These sites can also be found on our "websites for students" link above. Thanks for dropping by! The Maxxis Collection Has Arrived!!! The Maxxis Collection has finally arrived and we are sooo excited for the kids to dig in! I put this display up this afternoon, and already the books are flying off the shelves! If you aren't familiar with the Maxxis Collection or who Maxxis is, you can click here to read about it. Check out all these wonderful book titles...I'm sure Maxxis would approve! Meanwhile, the new holiday bookshelf display is up and ready for reading...so come on by the library and take a peek! We have something for everyone! A HUGE THANKS goes out to everyone that put together the Winter Festival! It was a huge success, and everyone had a great time! Our 2/3 kids created flipgrids inviting folks to stop by the festival and I shared it on Facebook, but forgot to share it here. So, even though the festival is over, if you'd like to see the videos, click here for the link! And that about catches us up on everything here...see you in the halls! And if you haven't had a chance yet, our 2/3 kids shared their Rock Quarry field trip with the other 2/3 mountain school kids, sharing questions and things they liked best about the field trip. This was set up by Livermore, so the link is different, but still available for parents to view. Enjoy! May you all have a wonderful and safe holiday break filled with lots of love and delicious food! A global movement to introduce students to computer science! 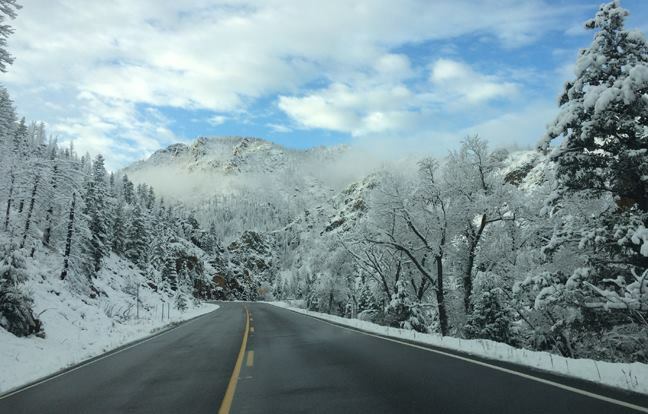 Here is a shot of my commute to work this week...what a gorgeous view! I think we all enjoyed the snow this week! Today the kids in grades 2-5 learned about Google Classroom...how to log on, join a class, and check for assignments. They also learned how to send email, which they were rather excited about, so parents, please check your email to see if your child sent you one, and give them a reply to make their day. If you did not receive an email, I might not have had one for you, or they were still learning the steps of email and ran out of time....so be on the look-out, and dont forget to check your spam folders just in case! With emailing on our agenda, we decided to review our computer safety rules and digital citizenship. The kids were also reminded to only communicate with people they know...parents, teachers and classmates. If the kids would like to log on to their email from home they can go to www.psdschools.org, then click on the "students" link, then scroll down and click on "PSD email access". Meanwhile, our K/1 kids are still practicing their mouse skills, learning how to log on to the computer and becoming familiar with how a computer works....oh, and also creating cool art in Pixie! The kids will not have class next week, and the following week is Thanksgiving, so I hope you all have a warm wonderful holiday!